More than eight months after the battle ended the government hasn't restored electricity or running water in Mosul's Old City. Hundreds of residents with nowhere else to go have come back to try to live in their damaged houses. 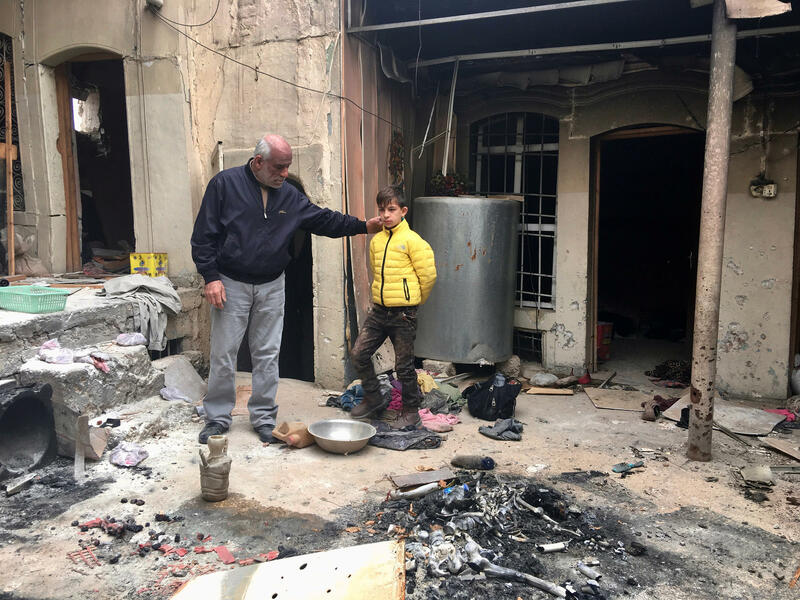 Ziad Abdul Qader and his son Mohammad, 11, came back to their damaged home in the Mosul's Old City. They found ISIS fighters' corpses inside. Abdul Qader owned a clothing store before ISIS. He says Mohammad has panic attacks and has forgotten how to read and write. Samira Sheet (left) sits with neighborhood residents in Mosul's Old City, waiting for an aid organization they say has promised to give them money. They're holding folders with their IDs. United Nations mine clearance experts say it will take years to remove all of the explosives from that section of the city. They include roadside bombs, suicide belts and weapons manufactured by ISIS as well as missiles, mortars and other explosives used by Iraqi and U.S. forces. 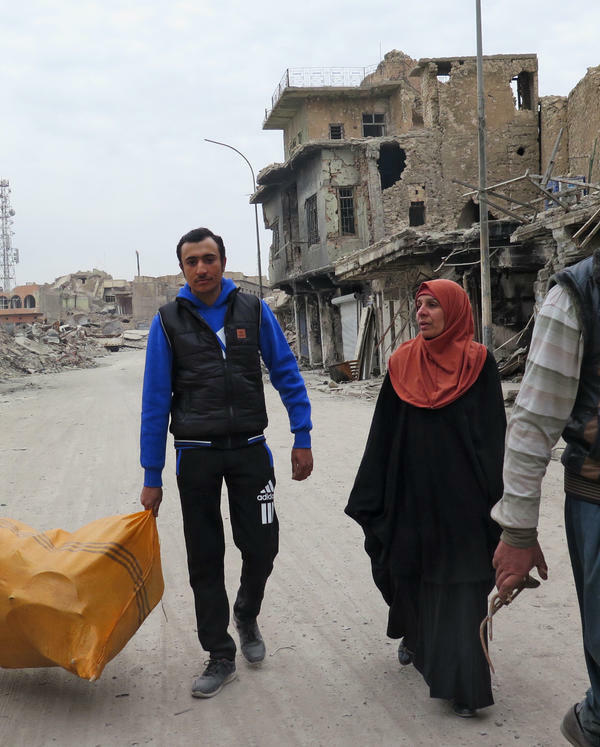 Mona Abed and her sons carry belongings they've retrieved from their Mosul home that was toppled by airstrikes. Fighters from Iraq's popular mobilization forces — paramilitary units nominally under Iraqi government control. Mobilized by Shiite religious leaders to fight ISIS, they are manning checkpoints in Mosul's Old City until local police can take over. Amer Mohammad walks with his son Yasser, 4, in Mosul. Mohammad is a health ministry employee who hasn't been paid in almost four years. His 15-year-old son Ahmed was killed in a mortar attack in the old city. He plans to shovel the bones into a bag and throw it in the trash. The macabre pile is just another obstacle for the former shop owner struggling to repair his damaged home eight months after U.S.-backed Iraqi forces drove ISIS from Mosul. 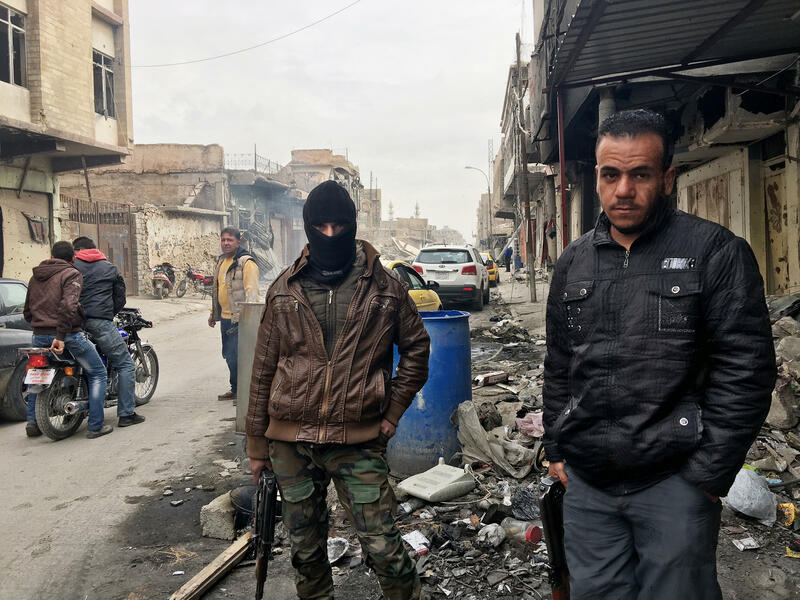 If some of the city's residents initially welcomed ISIS and its promise of good governance when it took over Iraq's second-biggest city four years ago, that dissipated as the regime became increasingly more brutal. It's difficult to find anyone who speaks well of them now. "People come here and spit on the bones," says Abdul Qadar, standing next to his 11-year-old son. "We suffered a lot under ISIS." When he and his family tried to leave Mosul last May after they ran out of food, ISIS fighters caught them, took their money, jewelry and documents and whipped them with rubber hoses. They took away his 24-year-old son after finding a banned cellphone among his things. Abdul Qadar hasn't heard from him since. The months of bitter fighting that ended the ISIS occupation of Mosul destroyed most of the historic section of town. Eight months after the battle ended, thousands of homes are still in rubble. There is no electricity or running water. Debris from collapsed buildings blocks the entrance to houses in some alleys. Decomposing bodies of ISIS fighters are strewn among the building trash. Praise for Iraqi forces for liberating Mosul from ISIS has turned to bitterness over what many residents see as deliberate government neglect. "We are not complaining about what God sends us but the government isn't helping us at all," says Samira Sheet, sitting on a battered pink wooden bench near the ruins of what once was the old section's main commercial street. Sheet, whose house collapsed in the fighting, had waited for hours every day for the past three days for a nongovernmental aid organization she said had told residents it would be distributing money. Homemade bombs, unexploded mortars and other explosives still litter the streets of the Old City, many of them buried under houses collapsed in mortar, artillery and air strikes. Most aid groups are waiting for more explosives to be cleared before operating in those areas. The sound of explosions regularly rings out in the Old City as ordnance teams detonate some of the bombs. 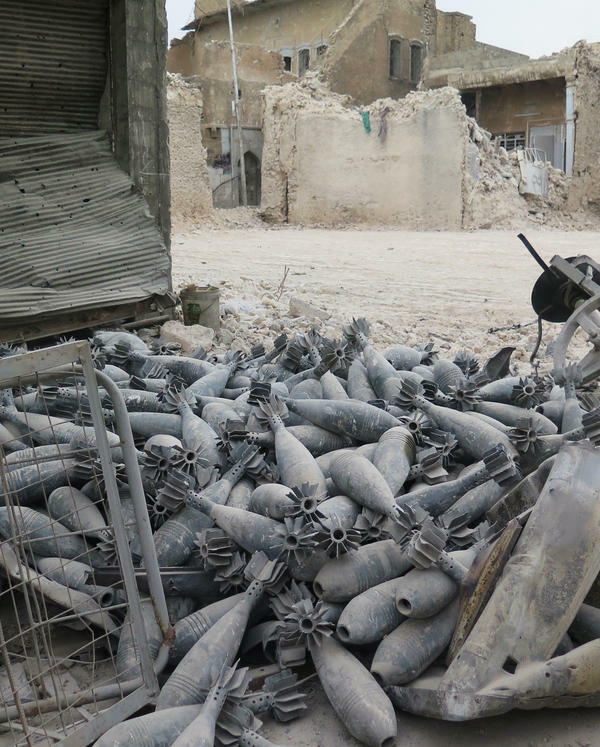 The United Nations Mine Action Service says most of the explosives are buried under an estimated 11 metric tons of destroyed buildings. U.N. experts say removing them all could take "many years." While Iraqi government services in many parts of the country are mired in mismanagement and corruption, many Mosul residents see the failure to restore even the most basic services to the Sunni Muslim city as evidence of something even more damaging. "Why is it that places like Tel Afar were rebuilt right away?" says a waiter in a restaurant in eastern Mosul, referring to another former ISIS stronghold with a large Shiite Muslim population. "It's sectarianism." On one Old City street, a group of men stand warming their hands around a barrel burning scrap wood salvaged from destroyed houses. The flames flicker in patterns through shrapnel holes in the rusted barrel. The government has promised compensation for damage but so far distributed none. With no electricity and no money for generators or fuel, what remains of the houses are cold and dark. Yellow taxis bump their way along the potholed streets, bringing back residents coming to assess the damage. Only the most desperate — those who have worn out their welcome with relatives or completely run out of money for food and rent — have come back to try to live. In January, hundreds of families that tried to return to their Mosul homes went back to camps for displaced people. Iraqi officials estimate more than 5,000 civilians were killed in the battle for Mosul — most of them in U.S. and Iraqi airstrikes, artillery and mortar attacks aimed at ISIS fighters. For many residents of the old city, their damaged houses became the tombs of loved ones. In the middle of one ruined street, a middle-aged couple walked with two young men struggling to carry either end of a huge plastic bag bulging with clothing, pots and pans. Mona Abed said she and her sons were taking whatever they could salvage from the wreckage of their home to a house they've rented on the other side of the city. Abed says she watched her adult daughter die after being badly injured as the roof collapsed. "We pulled her out but she was bleeding for three days and we didn't even have an aspirin to give her," Abed says. She says her 16-year-old son was also killed in the collapse. Another son is recovering from surgery for a bullet in his head. "We came back to the house and there is no house — it's just a plot of land," she says. ISIS is believed to have killed thousands of people in Mosul. But most of the damage and the dead are from airstrikes by Iraq and the U.S.-led coalition. They include mortars and artillery attacks as well as air-dropped munitions aimed at ISIS fighters. With no escape route out of Mosul, several hundred thousand civilians were trapped with ISIS as security forces closed in. The United States says it will provide loans and loan guarantees to American companies to help reconstruction but won't provide any direct funding for the $88 billion Iraq says it needs to rebuild Mosul and other cities freed from ISIS. In the doorway of a damaged house on a nearby street, a slender woman in a headscarf stands softly crying. Ahlam Zaidan lost her husband, two of her sons and her nephew in airstrikes and mortars on three successive days last March. "They died one after the other," she says. "Who can bring them back to me?" With their house destroyed, Zaidan and her sole surviving child, Mohannad, 15, have been living in her brother's damaged house for more than two months without electricity, heat or running water. Apart from the huge amount of explosives, the city is relatively safe — the ISIS fighters who controlled Mosul are almost all dead. But local police haven't been deployed here yet. Instead, paramilitary fighters from southern Iraq armed with AK-47 rifles man checkpoints marked by Shiite flags. The fighters say they haven't been paid in months. Residents tolerate them but accuse them of looting houses, even stealing copper wire from electrical cables to sell. "They come here to take what they can and go back home," says Alia Tawfeeq in the courtyard of her damaged house. "ISIS wasn't in this house — even the power lines they stole." Some of the residents here are civil servants with what would normally be a steady salary. But because they remained in Mosul under ISIS — many unable to leave — they haven't been paid by the central government for four years. Officials say they need more time to run security checks to screen out suspected ISIS members. Amer Mohammad, 53, a soft-spoken Health Ministry employee, says he and a group of men would go door to door checking on families to see if they were OK while ISIS was in charge. He points out the gate to a garden near a house where he buried an elderly man who died of illness after weakening from hunger and dehydration. "This was one of our Christian brothers," he says. "We protected them and gave them food and water." Mohammad's 15-year-old son Ahmed was killed in a mortar attack. Picking his way around the rubble, he holds his 4-year-old son Yasser tightly by the hand. He says Russian ISIS fighters forced him from his house. After ISIS was driven out, even the electrical cables from the water pump for a well had been looted. Mohammad says the government can't bring back their loved ones but they can at least help them rebuild. "We need services — they just need to take away the rubble. We need water tankers to come so we can drink clean water," he says. "If they get rid of the rubble and repair the streets, a man can rebuild with his own hands." It's been eight months since the battle to force ISIS from the Iraqi city of Mosul. Many areas remain in rubble from U.S. airstrikes and fighting by both sides. Iraq did gather almost $30 billion in pledges for international aid to help rebuild. Most is for huge projects that will take years. 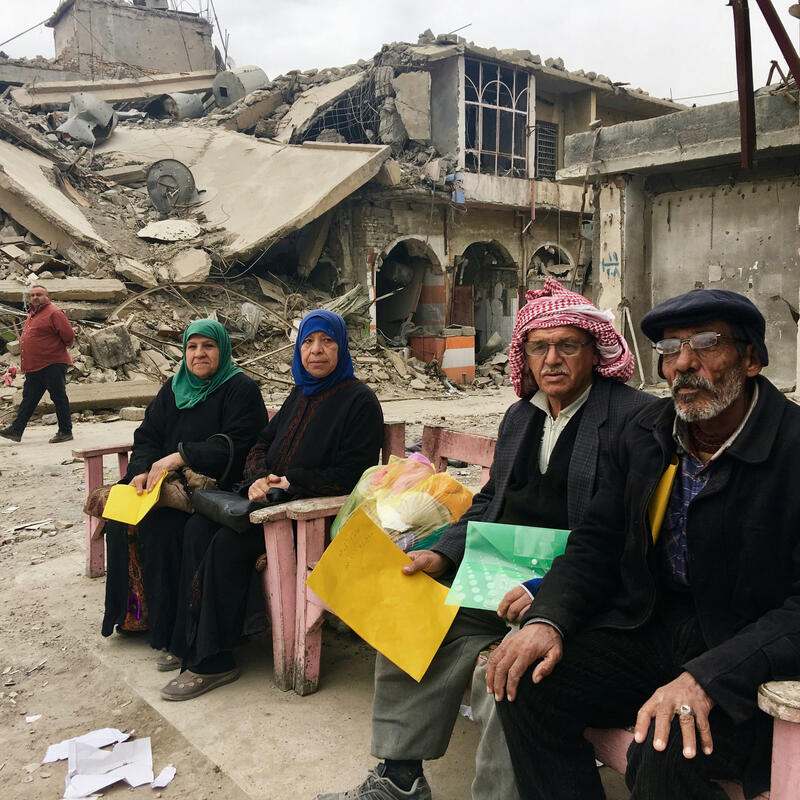 NPR's Jane Arraf went back to Mosul, and found reconstruction badly lacking and residents desperate for help. JANE ARRAF, BYLINE: Samira Sheet and a few of her neighbors have been sitting on a battered wooden bench on a street full of rubble since early in the day. ARRAF: ...And the day before that and the day before that. They were told by an aid organization that if they registered and brought their documents, someone would come back and give them money. But no one's come, and they don't know the name of the organization. ARRAF: "My house collapsed, and my son is injured. We don't get help from anyone," Sheet tells me. 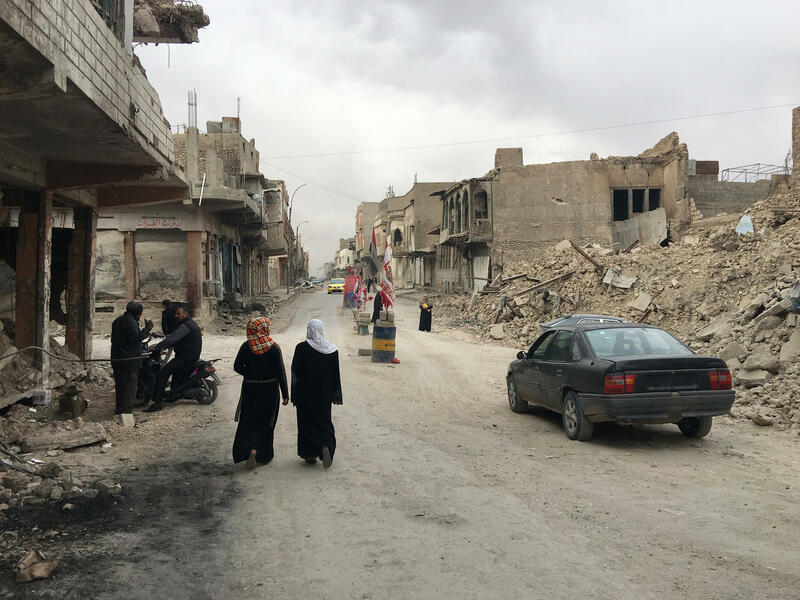 Thousands of homes collapsed here in the old section in airstrikes and mortar attacks while Iraq and the U.S. were fighting ISIS in Iraq's second-biggest city last year. That was eight months ago. And it looks pretty much the same here as it did when the city was liberated last July. 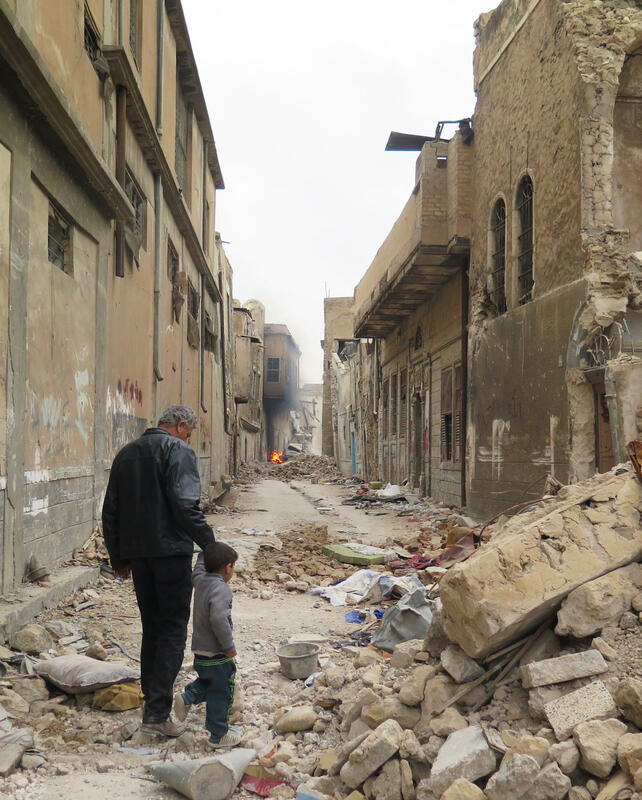 ARRAF: Streets full of grieving families trying to live in the ruins of houses. ARRAF: Amer Mohammad, known by Abu Ahmed, is a resident who worked for the health ministry. He knows every home in this neighborhood. Holding his 4-year-old son Yasser by the hand, he takes us on a very grim tour. ARRAF: So we're in the Christian quarter and going into an old house. Oh. Abu Ahmed is showing us - it still really smells awful. He's showing us a pile of charred bones - not completely burned. It looks like one or two people here. ZIAD ABDUL QADER: (Speaking Arabic). ARRAF: The homeowner, Ziad Abdul Qader (ph), says the bodies were ISIS fighters. Christians and Muslims like him both suffered under ISIS. He says people worried about disease burned the bodies. He's come back to clean up the house. He plans to shovel the bones into a bag and throw it in the trash. ABDUL QADER: (Through interpreter) People come and spit on the bones. We suffered a lot under ISIS. They took everything from us - our money, our gold, everything. And then they whipped us - the men and the women. They almost beat us to death. ARRAF: ISIS took away is 24-year-old son last May after finding a banned mobile phone. They haven't heard from him since. Abdul Qader has brought his 11-year-old son Mohammad with him. Mohammad looks silently at the bones. ABDUL QADER: (Through interpreter) He has panic attacks and nightmares from the airstrikes and the shelling. He's in fourth grade, but he's even forgotten the alphabet. We go over it every day, but he doesn't remember. ARRAF: Abdul Qader was middle-class. He had a clothing shop in the market, but it's destroyed now. And all the money he'd saved, they spent on food while ISIS controlled the city. He had to borrow the $2 for a taxi from his relative's house across the river. ARRAF: We continue through the narrow streets. So this looks like an earthquake hit. The rubble here is piled up maybe 20 feet. It's covering the entrances to these houses where the roofs have collapsed. There are old tires. And this is where they say there was a house they called the English house. UNIDENTIFIED MAN #1: (Speaking Arabic). ARRAF: They say it was the British Consulate in the 1950s, very elegant. Like almost everything else, though, it is now a huge pile of smashed stone and broken concrete. Throughout this district of the city, there's no electricity, no running water. Corruption and mismanagement means the Iraqi government struggles to provide those things even in Baghdad. UNIDENTIFIED MAN #3: (Foreign language spoken). ARRAF: For the central government, places like Mosul are barely on the radar. We passed by people burning wood to keep warm. There's no money for heating fuel. Our guide, Abu Ahmed, points out a home where he buried an elderly man in the garden. He says the man died of illness after being weakened by hunger and dehydration. MOHAMMAD: (Through interpreter) This was one of our Christian brothers. We protected them. We brought them food and water, but they didn't leave - poor people. ARRAF: At another house, Mohammad Assim and his brothers have been working for weeks to remove the broken concrete from their home. Their 35-year-old sister died here. UNIDENTIFIED MAN #4: (Speaking Arabic). ARRAF: He's pointing out where the mortar came from - right through the roof, it looks like. And then the wood is all splintered where it went through the door. And inside is the room where his sister was killed. ARRAF: Abu Ahmed, who's 53, had a 15-year-old son killed in a mortar strike. We meet dozens of people in the neighborhood. And there literally isn't a single family who hasn't lost someone. ARRAF: Ahlam Zaidan is standing in the doorway of a damaged house, and she's crying. On three successive days in March, airstrikes and mortars killed her husband, two of her sons and her nephew. ARRAF: "They died one after the other," she says. She has one child left, Mohannad, who's 15. ARRAF: As we speak, there is the sound of an explosion, an ISIS bomb being detonated by the military. They're still finding them on these streets. The danger from unexploded bombs has chased away young volunteers who were clearing away rubble from people's homes. And it's a big reason that aid agencies that could provide water and fuel and help rebuild aren't coming here. U.N. says it will take years to clear all the explosives. No one here can recall seeing a government official visit. ARRAF: "ISIS were killers, and the government are thieves," one woman says. Others say the Shiite-led government is neglecting them deliberately because they're Sunni, and it thinks they supported ISIS. Abu Ahmed says if they just had a little bit of help, people would do the rest themselves. ARRAF: "We need services, the government to clear the rubble and give us electricity and clean water," he says. "Then we will rebuild with our own hands." Jane Arraf, NPR News, Mosul. Transcript provided by NPR, Copyright NPR.